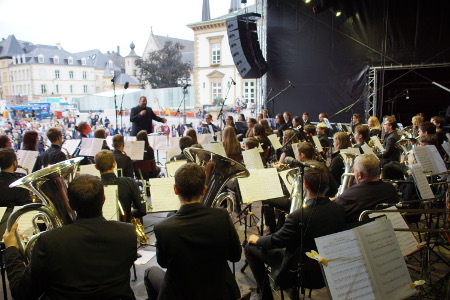 The National Youth Wind Orchestra Luxembourg (NYWOL) is an organization of the Music School of the National Music Federation of Luxembourg “Union Grand-Duc Adolphe” (UGDA), which meets every year for a working session and concert tour in a different country. The first session of the orchestra was organized in 1974 with a concert tour in Czechoslovakia and then in 1976 to the United States (Illinois and Michigan) on invitation of Blue Lake Fine Arts Camp. After a long interruption the orchestra was reestablished in 1991 with a concert tour in Austria and Liechtenstein. Since then, annual sessions have taken place in Belgium, France, Germany, Great Britain, Italy, Spain, Portugal, USA and Wales. This ensemble is composed of young musicians aged between 14 and 20 coming from various conservatories, music schools, and music associations of Luxembourg; it includes prize winners from the «Luxembourg Competition for Young Soloists». The aims of the orchestra are to support the musical education of young musicians from Luxembourg, to promote a varied repertoire for wind orchestra, especially works written by Luxembourg and European composers, as well as to promote youth exchanges between different countries. The orchestra is conducted by professional conductors and tutors from Luxembourg and abroad. The rehearsal session will take place in Luxembourg from July, 17th to 20th with a final concert. From July, 23rd to August 7th, the NYWOL will be on tour in Canada and USA. It will perform at the Festival of Arts on invitation of the International Music Camp and at the Lyric Theater in Winnipeg. From July, 29th and August, 7th the NYWOL will be hosted in Michigan and Wisconsin in the frame of the Blue Lake International Exchange program with concerts in Greenville and Blue Lake Fine Arts Camp and finally in Milwaukee and Belgium. The orchestra is composed of 58 young musicians aged 14 to 20 years and a staff of 12 professional musicians and counsellors. The conductor of the orchestra is François Schammo, principal horn of the military band of Luxembourg and teacher at the UGDA Music School. He is assisted by the tutors Vanessa Lommer, Jessica Quintus and Sonja Soons (woodwinds), Dino Ajdarpasic, Tom Braquet and Philippe Schwartz. The orchestra will also perform a choral part under the direction of Tom Braquet and Vanessa Lommer. The UGDA Music School is responsible for public music education in 56 municipalities of Luxembourg (with 5.700 students). It also organizes numerous extracurricular activities on the local, regional, national, European, and international level such as training and development workshops as well as bilateral and multilateral exchanges in collaboration with other cultural or youth organizations, notably the Service National de la Jeunesse (national youth service). Since the 1970s the International Music Camp invites young musicians from Luxembourg every year to attend the IMC. Also, UGDA hosted in 2014 and 2018 different youth ensembles of Blue Lake. On invitation of Blue Lake International Exchange program the NYWOL toured in 2015 in the States in Illinois, Michigan, and Wisconsin. François Schammo was born in 1978 in Luxembourg. He is a graduate of the Conservatoire de la Ville de Luxembourg (including a diploma in horn and chamber music in the class of Prof. Carlo Pettinger) as well as the Trossingen University of Music (diploma in artistic education in horn with Prof. Francis Orval and conducting with Prof. Toni Scholl). In 1993 and 1994, he won the Luxembourg competition for young soloists, which gave him the opportunity to participate in the “International Music Camp” in the United States. He was a member of the European Union Youth Wind Orchestra in 1994 (Portugal), 1995 (Luxembourg), and 2002 (Italy). Furthermore, he plays as a regular replacement in the “Orchestre Philharmonique du Luxembourg”, “Orchestre Philharmonique et Royal de Liège”(B), and the “Landespolizeiorchester Baden-Württemberg” (D). Since 1995, François has taken part in many master classes in Europe, Canada and the United States, including with Frøydis Ree Wekre, Dr. Steven Lawson, André Cazalet, Nico De Marchi, Roger Bobo, Enrique Crespo, Marco Pütz (orchestration), Henrie Adams, Alex Schillings and Jan Cober (conducting). Since 1996, François is the principal horn with the Luxembourg Army Band (Musique Militaire Grand-Ducale, Luxembourg). Furthermore, François is the conductor of the music society “Fanfare Royale Grand-Ducale Luxembourg”, and since 1999 a member of various brass ensembles, including “Les 5 Gourmets” and “Symphonic Brass Luxembourg”. François Schammo is a teacher at the UGDA Music School and, since 2005, conductor and artistic director of the “National Youth Wind Orchestra Luxembourg”. He conducted the “Landespolizeiorchester Baden-Württemberg” and the “Rundfunkblasorchester Leipzig (RBO)”. All events are free to the public except where noted. All times are Central Standard Time and are subject to change. For more up to date information, please contact the IMC office via email or phone (701) 263-4211 (June-July) or (701) 838-8472 (September-May). There is a gate charge ($20 per vehicle for day pass or $40 per vehicle for a season pass) to enter the International Peace Garden. The 2019 sponsors for the Festival of the Arts Series are: First National Bank & Trust of Bottineau, Greater Rugby Area Convention and Visitors Bureau, Sunrise Credit Union-Boissevain, Broadway Family Dentistry of Minot, Dunseith Community Betterment, Rolette State Bank, Starion Financial of Dunseith, and Dacotah Bank of Rolla.